It sounds like this restaurant is permanently closed. I will confirm before I delete this post, but in the meantime I just found a new Loving Hut around the corner from Xindian Station, on the way to the footbridge. And of course there's Peace Cafe up in Garden City. 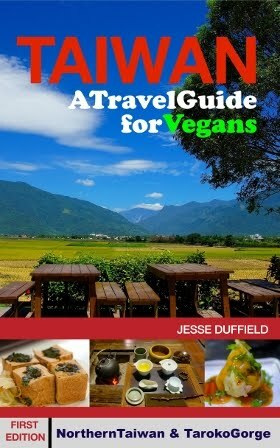 Taiwan has many thousands of simple pay-by-weight buffets, most of which serve similar dishes based on tofu, fake meats and fresh vegetables, and while living in Taiwan I used to eat at them almost daily. Most are run by Buddhists and followers of I Kuan Tao, and as such serve dairy products, and /or egg, so fake meats should be treated as suspect. Nonetheless, these buffets offer an extremely convenient, affordable and reasonably healthy option for a simple meal, and it would be hard to be more than a few blocks from one in any Taiwanese city. At such places, expect minimal (but friendly) service, and always take your own plates to the disposal place, often out on the street. Besides these buffets, Taiwan is also famous for its five-star all-you-can-eat buffets, such as my favourite Evergreen Vegetarian. These are fine-dining establishments, and meal prices can reach up to 1000NT (excellent value for what you get, especially if spending foreign currency). The Loving Vegan is one of a few buffets which offers an 'all-you-can-eat' deal of the typical dishes found at the more humble buffets, at an excellent price of only 120 TWDs. And the best thing: it's all vegan, so there's no need to worry about what's in the fake meat. all the old-time buffet favourites, just guaranteed vegan and only 120NT. If you live in Taiwan, this place provides an exceptionally good-value meal, if you are in the area (thought it's probably too far from central Taipei to make it worth doing regularly). And if you're visiting Taipei it's an opportunity to try all the traditional Taiwanese dishes found at common buffets, without worrying about egg, dairy or worse in your fake meat. Loving Vegan is located a few minutes walk from MRT Xindian District Office Station, the second-to-last stop on the green line. It would combine very well with a trip up to @Peace Cafe in the Xindian Mountains, with perhaps one either side of an explore around Bitan Lake. Together these would be well worth an afternoon's outing for anyone spending a few days or longer in Taipei. Opening Hours: 10:30-2:30; 5:00-8:30 (everyday). I tried to check this place out last night for dinner and looks like they may be permanently closed. Just a heads up! I'm sorry you went somewhere from my blog that wasn't there (if you did) and either way thank you fro letting me know! I'll make a note of it for now, and try to find out. In the meantime (for you or anyone else in this area) I've just found that there's a new (tiny, but good) Loving Hut around the corner from Xindian Station. I'll post more about it soon.